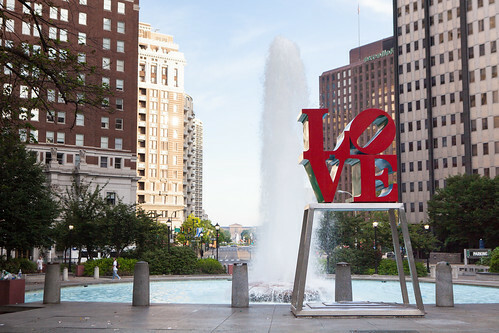 During the July 4th weekend, a few friends and I drove down to the City of Brotherly Love or simply, Philadelphia, just to get away from New York City for a bit. So much has changed since I’ve last visited this fair city nearly a decade ago. It still has it’s old fashioned charm but it feels modern and has more energy than what I remembered. The food scene completely changed for the better, as most restaurants around there tend to be small and chef-driven so you’ll see something familiar yet it’s different. You’ll read more of my eating ventures as I keep posting about them. 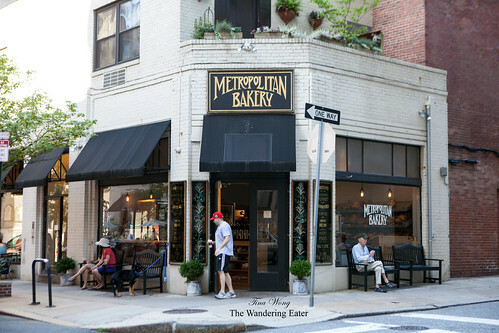 Our first stop in Philly was breakfast at the Metropolitan Bakery & Cafe. 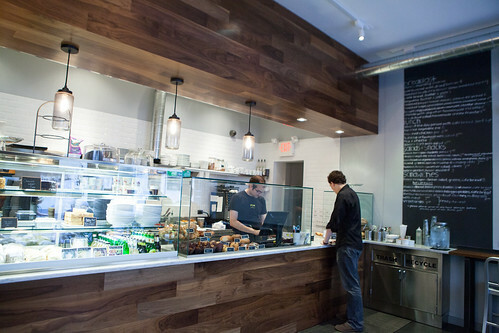 We visited their beautiful flagship location at Rittenhouse Square. The bakery reminds me of one of those old school European-style bakeries that is essential to a neighborhood really because their goods look and tastes delicious. 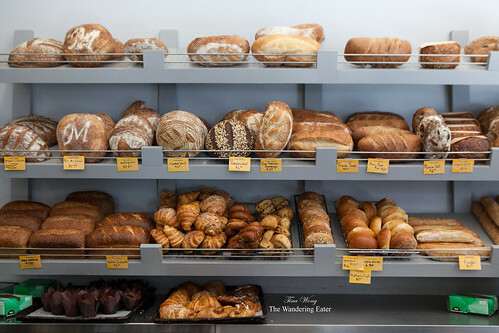 This bakery (is now a mini-chain as it has a few locations around Philly) was started by Wendy Smith Born and James Barrett opened Metropolitan Bakery in 1993. It started as a bread bakery, using all-natural starter, a long-slow-cool rise and crackling crusts were unique in Philadelphia and the U.S. They use locally sourced, sustainable ingredients and whole grains then (before those words became the big thing for the past decade). 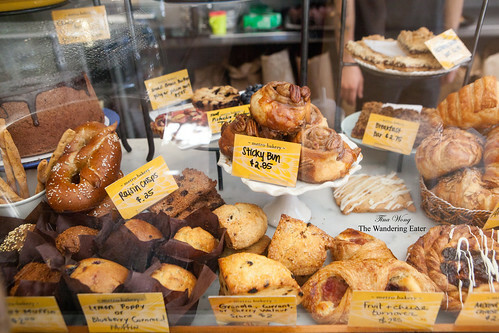 On an early Saturday morning (at 8 AM), people were lining up for their glorious morning pastries and beautiful rustic loaves of bread. An employee suggested we should go next door to their café to have a calmer, better experience rather than to have pastries to go. 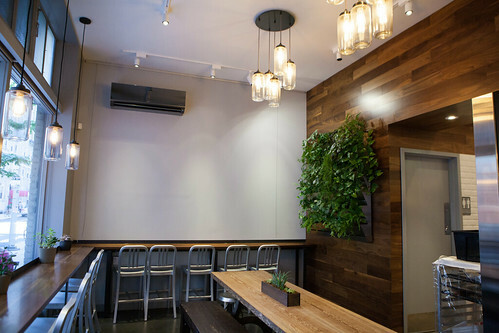 The café looks and feels very welcoming with the warm wood to the minimalist interior with tall chalkboards of their menu. Their large cappuccinos ($4 each) was great and the whole milk used in there was rich and creamy. 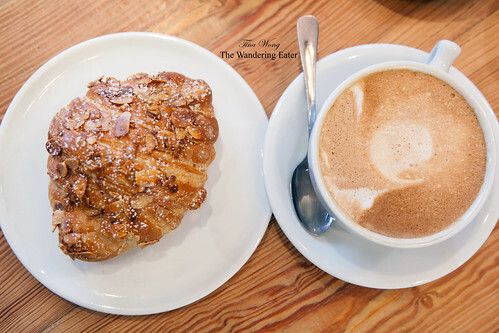 The almond croissant ($2.85) was filled with a lot of not-too-sweet almond paste and it the croissant itself wasn’t too buttery or greasy. The fig bars ($1.35 each) was an elegant version and tastier version of the Fig Newtown. 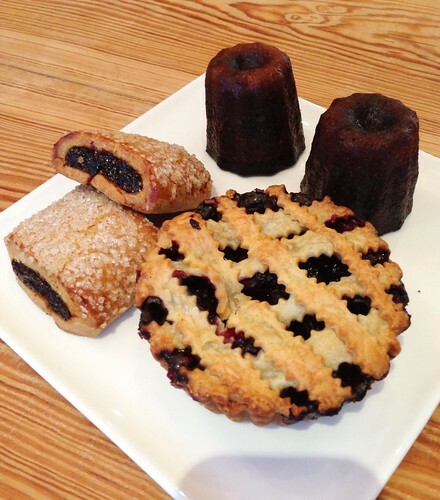 The blackberry lattice tart ($5.25) captured the essence of the sweet-tart berry and the buttery crust crumbled when we break it apart with our forks. The canelés ($1.65 each) were pretty good with its deeply caramelized, crunchy exterior meet with a slightly moist crumb. This was one of the better ones I’ve eaten so far. Their seasonal buckle ($3.35) that’s only available on Saturdays featured the blueberry. 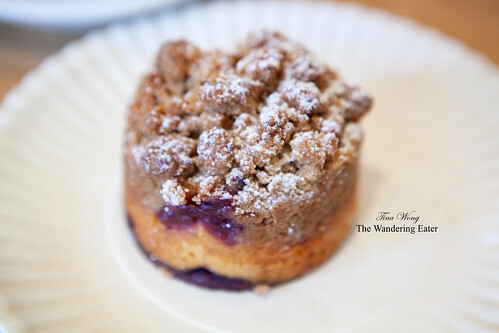 This was more like a blueberry crumb cake that has a moist, very fine crumb with a good amount of ripe blueberries streaked throughout this lovely pastry. I couldn’t help eating the large crumbs that topped this cake – it’s too good. 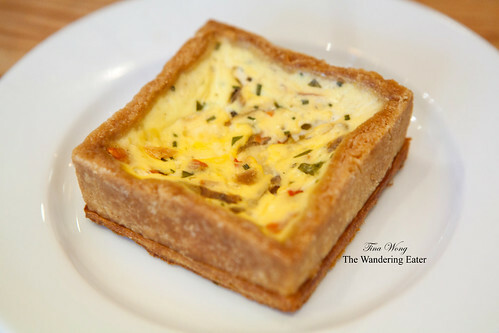 The savory tart ($5.95) is an individual sized quiche, so to speak. The smooth custard flecked with red peppers and herbs and a sharp hint of cheese all on a sturdy, buttery crust. 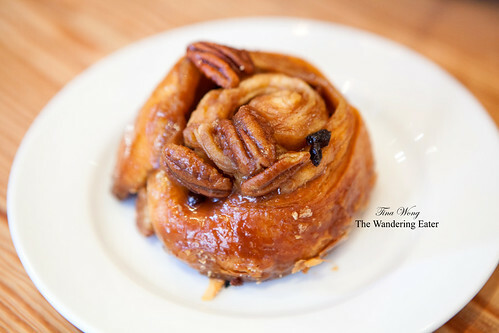 The sticky bun ($2.85) was a good version of the decadent morning pastry. 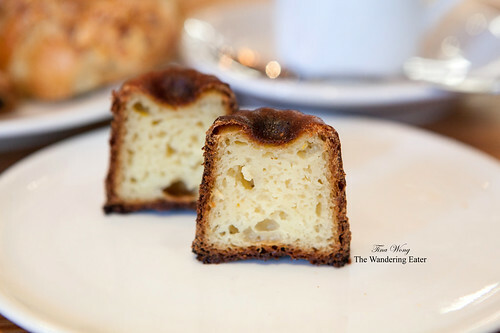 Probably we should have come in earlier since I was hoping this bun would be ooey gooey kind of sticky but it’s still very delicious with the caramel having that haunting note of orange zest. Despite of its simple appearance the miche (whole loaf $9.80) was arguably the best thing we had. The crust was beautifully formed and crisp. 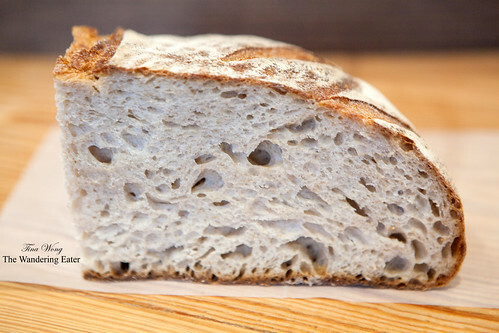 It’s multiple holes, textured crumb was fluffy and tasted wonderfully sour and complex. I could tell this bread baker took his lots of care and time to ferment and bake this bread. 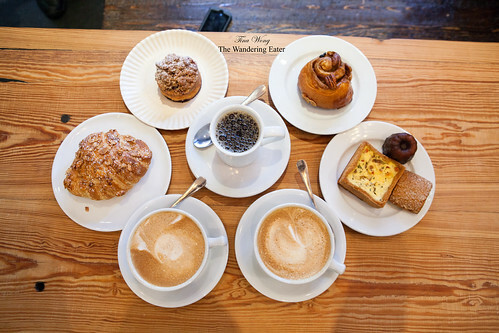 If you are ever in Philly, this is a great bakery to have a quick snack or a casual meal at the café since they do serve sandwiches and salads (we opted not to since we had more things to eat on our agenda).